Welcome to the newest installment of Office Visit, where we visit a Townie's office and profile his or her equipment, design or unique practice philosophy. If you would like to participate or nominate a colleague, please e-mail ben@dentaltown.com. 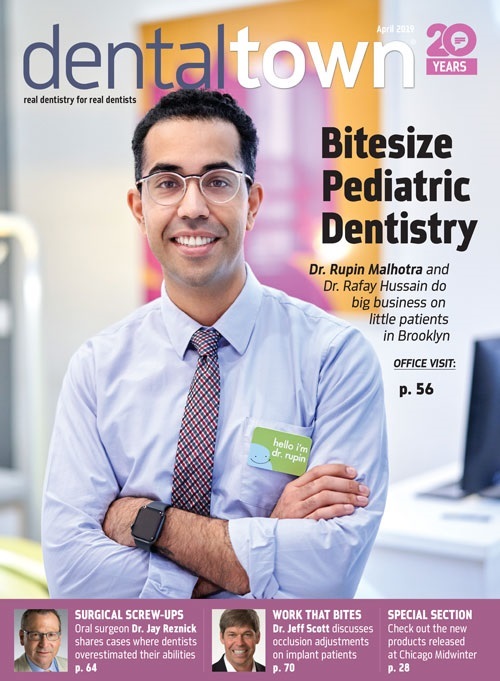 This month, Dentaltown Magazine had the opportunity to speak with Drs. Michael Hoffman and Stephen Barnes, of Falls Oral Surgery and Dental Implant Center, in Ohio. This two-surgeon team talks about their evolving interest in implants, along with how technology has affected the way they practice, and the influence Dentaltown has had on their practice philosophy. Why do you think dental implants are important to the dental profession as a whole? Barnes: Technology as far as implants go has really taken off and it's now allowing us to do things that 10 or 15 years ago were virtually impossible. We can do anything from restoring single teeth and restoring multiple teeth to providing excellent retention of patients' dentures. Implants allow patients to regain function that had been lost. Since we remove a lot of teeth, it's nice to have a reliable option to replace them in a way that is almost as good, if not just as good as the teeth were prior to becoming decayed or infected. Implants improve aesthetics and most of all they can restore self-confidence in patients. Hoffman: It really gives patients a second chance at a normal set of teeth. We didn't have that ability until recently. Why did you choose dentistry/oral surgery as a profession? Hoffman: When I was a child I went through the usual stages of wanting to be a police officer and a fireman and for some reason in the third grade, I decided I wanted to be a dentist. It was an opportunity where I could own my own business and still have a positive impact on people's lives. Once I was in dental school I found that I really enjoyed the variety that oral surgery presented and now, I can't imagine doing anything else. Barnes: I come from a family of physicians actually. When I had to do a career day in high school I went and spent a few days with an oral surgeon in his office. I liked the ability to have your own practice, do your own anesthesia, perform surgery, but still at the same time have at least some semblance of a home life. It's great. I wouldn't choose to do anything else. What is your current practice philosophy? 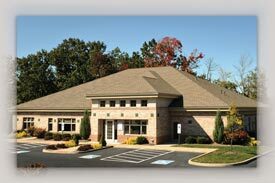 Hoffman: We want to provide the finest oral surgical care to every patient in a gentle, comforting environment. We're going to go the extra step to make each experience special and make our patients want to return to the practice. What does your practice do that sets you apart from other oral surgeons in your area? Barnes: We pride ourselves in our surgical work and our expertise. We are both board certified surgeons, and I think that demonstrates an elevated level of knowledge in a variety of surgical topics and shows a commitment to continued learning that we both share. Also I like to think that our communication with our referring dentists is top notch. We really try to make things easy for the restoring dentist. We are up to date with technology and really utilize our Web site to educate patients about procedures and postoperative care. Hoffman: In regards to the office, the idea in designing it was that it not look like a clinic. When you walk in, it looks like your living room and that was the whole idea to make people comfortable as opposed to make it a threatening environment. Another thing that makes us different is our low employee turnover. We treat them as our most valuable assets and that makes it nice for patients to see a familiar face when they return. How might a patient benefit from implants? And how are they different or better than a bridge or crown alternative? Hoffman: With implants you don't have aggressive removal of adjacent tooth structure to get a restoration. The research out there clearly shows the longevity of implants versus traditional bridgework. Implants in the long run are much more conservative and they offer a better longevity than traditional crown and bridge. Hoffman: When Dr. Winston was looking to practice part time, I interviewed a lot of candidates to join the practice, but really didn't find anyone who shared our people-centered personality. If you know Dr. Winston and me, we're pretty low-key. We don't throw instruments, stomp our feet or yell. We were looking for someone with the same comforting attitude. Steve came down when he was chief resident at Metro to observe implant techniques. I loved his personality. We started talking about joining together. I was thrilled when I asked him to join the practice and he accepted. Who are some of your dental mentors? Barnes: Dr. Jon Bradrick, my residency chairman, and Dr. Barry Stein, who introduced me to the field of oral surgery. Also, Michael Pikos, Anthony Sclar, and Robert Marx – they are all oral surgeons and I'm fascinated by their contribution to the profession. Hoffman: Dr. A. Thomas Indresano, my program director who really got me started. And Dr. Winston was really big in getting me started and piquing my interest as well. Also, Anthony Sclar's textbook is a must for anyone doing aesthetic implant work. Barnes: My favorite procedure to perform is an open sinus lift. Hoffman: That's also my favorite. Barnes: It's fun, it's predictable, and it's an impressive surgery to observe. Barnes: Currently I have the privilege to work on a gentleman who was the victim of a pretty bad fall. He is a young college student who unfortunately sustained a lot of dentoalveolar injuries. The case has so many facets. I think he is going to be my most rewarding case from a personal standpoint, first because of his story and second because of all of the surgical complexities that are involved with his care. I have also been involved with a charitable organization called Convoy of Hope. It was so gratifying to provide much needed dental care right here in Northeast Ohio. Hoffman: I've gone to Honduras twice with medical mission teams doing oral surgery. We'll travel up into the mountain villages where people see a dentist maybe every three or four years. It's a very humbling experience. It's also a test of surgical skills since there's no electricity, handpieces or suction. You get pretty good with working with hand instruments. It's challenging and rewarding. Since you began your career, what are the three biggest changes you've seen in the profession? Hoffman: First, the explosion of implant dentistry. When I started practicing 18 years ago, patients came to the office not knowing what implants were. Now they come to the office, and not only do they know what implants are, they know that they want an implant and they usually have a friend or a neighbor that already has one. Second, the computerization of dental offices. When I started I never even dreamed of having a computer in each treatment room. I can't imagine not having them now. And third, the new grafting materials – BMP products, PRGF, Osteocel. All these products are making bone grafting easier and more predictable with less discomfort for the patient. That's going to be the next big area that takes off in oral surgery. Looking ahead, what would you like to see dentistry do in terms of the way it operates as a profession in the next five to 10 years? Barnes: I think as technology continues to improve, you're going to see more computer-guided surgical procedures. I also foresee better, more predictable and cheaper grafting alternatives. You're looking at shorter healing times as they continue to modify implant surfaces. As predictable as implants are now, they're only going to get more predictable. Hoffman: I think what I'd like to see is what you are doing at Dentaltown. Dentists as a group need to come together more and become a unified force. One of the things I love about Dentaltown is the idea that dentists are all there learning together and learning from each other. It's a very nice, nonthreatening place for discussion. As we go forward, I'd like dentists to stop looking at the dentist down the street as a competitor and more as a colleague. There are patients for everybody. I'd like to see dentists come together and become a more cohesive unit. What would you say is your biggest source of new patients and how do you market to get new patients? 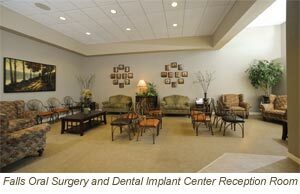 Barnes: Our biggest source of new patients comes from our strong referring dentists. 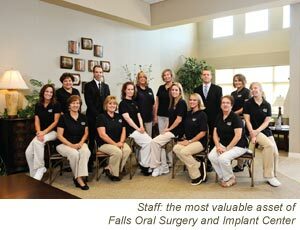 We are extremely grateful for the dentists we have as a referring group to our practice. We have a lot of very loyal and very good practitioners who have entrusted their patients with us and that's how we get most of our new patients. Hoffman: Probably 90 percent of our patients are referral-based. So we nurture that relationship with our referrals. All business aside, we're actually good friends with a lot of our referring dentists. Barnes: I enjoy working out and golfing. I like to garden and enjoy traveling. I spend a lot of time with my wife who's a general dentist. Hoffman: I spend a lot of time racing soapbox derby cars with my kids. I have three children. I also enjoy running. My wife has got me running marathons. I have finished six marathons; she's run 13. Hoffman: I think it's important for dentists to take practice management courses and really understand how to run a business. It doesn't matter how good at dentistry you are, if you can't run an office and be somewhat profitable.